Every historic motor racing festival has its theme. At the Le Mans Classic you will see the greatest collection of prototypes and sportscars that graced the grid at Le Mans throughtout the year. At the Goodwood Revival, you will see the absolute highlights and rarities from the period between 1948 and 1966. The Oldtimer GP at the Nürburgring has that special German touch, heavily featuring cars from the glory days of DRM and DTM. The GP Historique at Monaco has its own unique feature: it will easily present the most Grand Prix cars you will ever see in one weekend. We dived right in – not in the swimming pool, mind you. A fine day in May: all the Monaco glitz but with less of the pomp and circumstance of the regular GP. 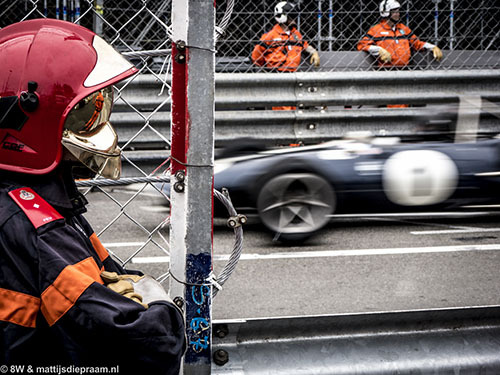 Celebrating the glorious history of the Monaco GP, from its dawn in 1929 to a year that is by now nostalgia to most of us – 1978 – the Grand Prix de Monaco Historique is the bi-annual zenith of historic Grand Prix racing. 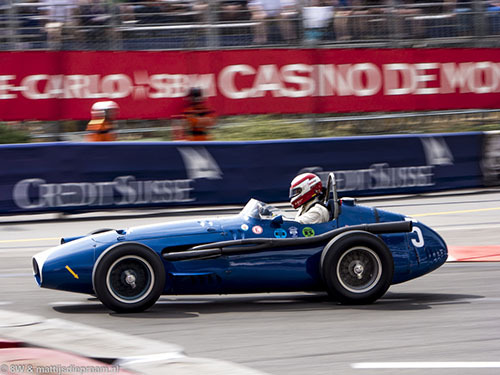 It has pre-war Grand Prix machines, the front-engined Formula 1 and 2 cars of the fifties, the 1.5-litre cars of the early sixties and the 3-litre machines of the late sixties and the seventies. And even within that theme, there is specialisation. 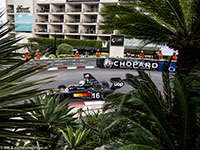 Where most events with a FIA Masters Historic Formule One fixture on its programme will have all the cars from the 3-litre era in one race, Monaco has two. 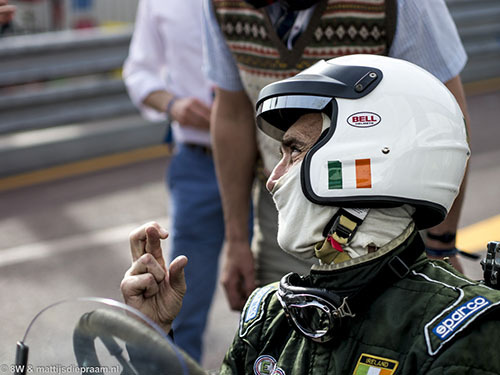 For two-and-a-half days in May, Monaco is seventies F1 heaven. We saw that all too well on Saturday when Carlo Steinhauslin crashed his Tecno PA123 hard in the tunnel. The front of the rare Martini-liveried Italian machine was absolutely shattered, a sorry and horrid sight. Other damage that hurt was the ex-Clark Lotus 49 R2 that was shunted on Friday, not to mention the very silly accident between John Smeeton's March and John Goodman's Ferrari in the 1966-1972 F1 race, with the Ferrari driver looking very much out of his depth as he swerved into Smeeton's path, and tearing up a fine 312B2 in the process. Their repair will take long and hard work. This looked especially so with the Tecno, since it didn’t need a close paddock inspection to see the intricate piping and welding that was conjured up by the Pederzani brothers to rival the simple DFV hordes. “Si, molto complicato!”, its mechanic agreed, before pointing out the various idiosyncratic plumming solutions running from back to front and vice versa. Nick Padmore, in full qualifying buzz, throwing his Wolf-Williams FW05 (née Hesketh 308D) across the covered oil track on his way from the Hotel Hairpin to Portiers. Another surprise appearance was Dan Gurney’s Eagle T1G, universally recognized as one of the prettiest GP machines ever penned. Having sat in a museum for ages, it was its first time out in Europe, having done only one race in the US ahead of Monaco. It didn’t have the Weslake V12 though, instead it was equipped with the stop-gap Climax 2.8-litre. “But that ran more miles than the Weslake car!” the mechanic quipped. Poleman Paddins Dowling crossing fingers crossed ahead of the start of the pre-war race. He finished third. Whereas most grids were packed to the absolute maximum – and to some drivers well over it – the pre-war race saw a relatively small turnout. With ERAs allowed in there was turmoil among the Bugatti owners, who feared they wouldn’t stand a chance against the fast British machines. This led to several Bugatti drivers deciding against racing. Paddins Dowling led away from pole but Matthew Grist in the Alfa Romeo Tipo B kept up. In the end, Grist grabbed victory from the ERA. Blue Maser. 'Stippy' had to overcome all sorts of problems to take Jos Koster's 250F 'Piccolo' to second place in the Serie B race. Indeed, ‘Stippy’ was having enough trouble on his own. On Friday, one of the driveshafts on his Maserati 250F ‘Piccolo’ sheared. The German crew on the Dutch-owned car fixed the problem but feared that they wouldn’t make it to the end of qualifying, let alone the end of the race. And indeed, the blue-and-white machine made its return to the pits very quickly into Saturday’s session. So, another broken driveshaft? “No,” said the mechanic, “one of the brake cylinders has failed.” At 10 PM on Saturday, Stippler was still driving up and down the paddock, accelerating and braking forcefully, testing the newly installed brake cylinder. But would the driveshaft hold? In the end, Pearson’s and Stippler’s fortunes reversed. While Roger Wills indeed powered away to an easy win, Pearson was a DNS, having become one of the casualties in qualifying. This left Stippler fighting over second place with Tony Wood’s Tec-Mec. After a magnificent battle which first seemed to go Wood’s way, the German did not only finish the race but came out on top, taking the last of the 250Fs built to a superb second place. Joe Colasacco's Ferrari 1512 with the typically mediterrenean backdrop at Portiers. After the pre-war cars and the fifties GP cars, it was time for the 1.5-litre machinery. Andy Middlehurst in the Lotus Classic Team 25 and Joe Colasacco’s Ferrari 1512 had set the pace in practice, and the two set off at the head of the field, only split by Paul Drayson in the Lotus-BRM 24. In the end, though, Colasacco in Lawrence Auriana’s beautiful Ferrari – with the most gorgeous engine note – failed to complete a second lap, leaving the monocoque car to wander off into the distance, like in the days of its original imcumbent. 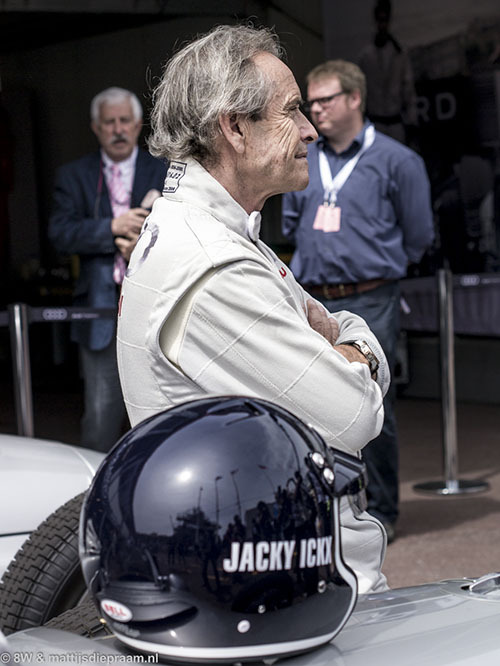 After the Auto Union demo by Jacky Ickx and a Renault turbo drive by Jean-Pierre Jabouille, the sportscars came out, in memory of those handful of sportscar races that were held at Monaco in the fifties. The race was easily won by Alex Buncombe’s Jaguar C-type, as it almost always does, making it two very much expected winners in a row. Only John Ure's Cooper-Bristol came close to the C-type. Then came the first of the 3-litre races, which meant that now it was going to be very loud. 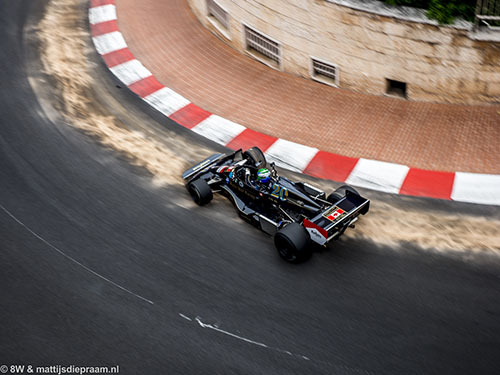 Whether they be V8s or twelve-pots, the noise these cars produce in between the houses of Monaco is positively ear-shattering, or negatively eardrum-shattering – the dB app on our smartphone topped 120 dB at the end of the tunnel… And it’s as loud for the drivers, Michael Lyons said, one of the pre-race favourites for both the 1966-1972 and 1973-1978 races. “Monaco is different, and it’s not just the track. The noise is so much louder. You really need good earplugs here. I’m sure it’s the same for you working right next to the track.” I couldn’t disagree. I thought that anyone not wearing his earplugs was a complete fool – or deaf already. Lyons, who is the man to beat in seventies F1 cars these days, was well aware of the no-margin-for-error character of the street circuit. “You can’t compare Monaco with anything else. Make one mistake and you’re done for the entire weekend. And it doesn’t need to be your own fault – I nudged the barriers with the Surtees this morning, simply because I had to take avoiding action. I came around the corner at Casino Square and I was the third car there, with two already in the barriers, and with yellow flags waving next to them. That was a bit too late! So you really need to be on your guard. But you can’t take it easy either, because then you will be slow. So controlled aggression is what’s required here. 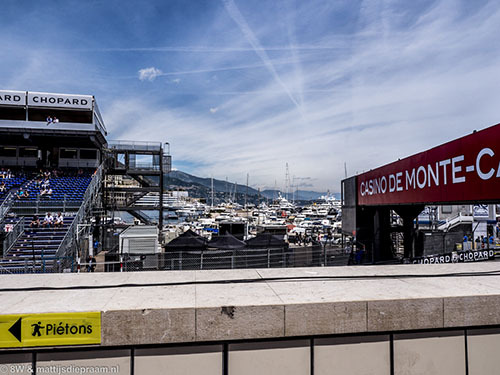 My favourite bit is Tabac followed by the Swimming Pool chicane. It’s so fast and the weight shift is amazing. You feel the back end slide as you exit the chicane, but to get those corners nailed is pretty satisfying. When I try to explain to people what it’s like to race around here, I always say it’s like getting your driving license at 17, then ‘borrowing’ your mum’s car and take it for a bit of joy-riding in a multi-storey car park!” It was a poignant comparison by the 23-year-old, who over the weekend did indeed borrow his mum Judy’s Surtees TS9 for the 1966-1972 F1 race and made it go as fast as it’s probably never done before… Nelson Piquet, the man who compared racing around Monaco with flying a helicopter in his living room, would have been proud. Richard Griot gave Dan Gurney's Eagle its European historic debut. Talking of Nelson, one car very much stood out in the quality field of seventies F3 cars that celebrated the era in which a win in the GP support race was a virtual guarantee of a drive in Formula 1. Piquet never won the race, unlike Elio De Angelis (whose car was also present), but the current owner of his epic Ralt-Toyota RT1 was eager to make amends. 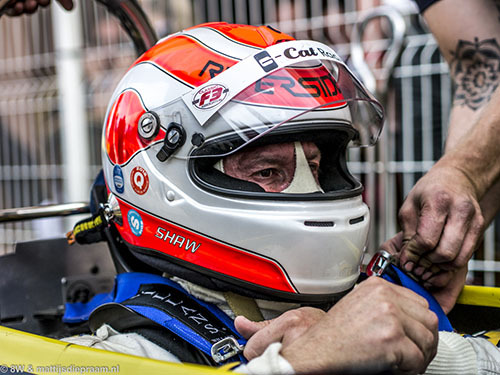 David Shaw, a known winner in the HSCC Historic F3 Championship, is even using Piquet’s helmet design to further help bring back memories of the days when the Brazilian dominated proceedings in British F3. Indeed, Shaw was on virtual pole, very much living up to the high standards set by the Ralt’s previous driver, when with 20 seconds to go in the session he came up to pass Stefano Garzi in the March 773. Perhaps Shaw was momentarily spooked having softly hit Garzi up the back while braking into the Hotel Hairpin but the next thing we heard – standing on the pedestrian isle in the middle of the hairpin – was a loud bang. Looking down to the righthander towards Portiers we saw tyre marks leading straight into the barrier, and a stricken yellow car driving on very slowly, having left its heavily damaged nosecone behind. The next moment the session was flagged off and marshals began covering an oil trail that led from Mirabeau all the way down into the tunnel. Having gone offline to pass Garzi’s car after the hairpin, that must have been the reason. Having had dinner at the Stars ‘n’ Bars, we ventured into the paddock late in the night, and sure enough, the last place that was still a hive of activity was Shaw’s spot under the awnings. His mechanics were looking desparate, and hadn’t even touched their beers. They would need them, since the car’s left-side was 35mm shorter than its right-side, so violent the bang had been. It didn’t need a carpenter’s eye to see that. Using hammers and a big block of wood as their tools of precision engineering, they set off on a mission. I said I would hate to see an empty spot on pole position, and they nodded in agreement. The following morning the first thing I checked was the yellow Ralt: it was fixed! No-one was there, so everyone was probably sound asleep after a long night’s work. The F3 bonanza would be the penultimate race of the day anyway, so they had time. Later in the afternoon, though, they were all there and buzzing with confidence. Measuring the front axle, they found it was exactly straight again – maybe even straighter than before! How long did it take them? “Until two o’clock in the morning”, one of the guys said. “He has to win it for us now!” The driver acknowledged the pressure. “I know I’m carrying a large responsibility now. I really owe it to the guys.” I told of Stippler taking his second place against all odds. “That’s what I need to happen!”, Shaw said, while looking for a piece of wood to knock on. “I must get a good getaway”, he continued. “That will be key. After that, I hope for a nice fight with Paolo Barilla.” The former Minardi driver and heir to the Barilla pasta empire had joined Shaw on the first row in his Chevron-Toyota B34, and was among several well-known names in the F3 race. Tiff Needell would start fourth in a Chevron B38 while Ollie Hancock lined up seventh in a Lola T670. Stefano Rosina was ninth in an Osella F3A. Flash from the past: Piquet's helmet design in that yellow Arno Brastemp Ralt-Toyota RT1. David Shaw's up-and-down weekend was one of the biggest stories of the event. So the start would be vital, as it always is at Monaco. The tension mounted as they all lined up. Some 38 cars had to come to a full standstill, so the drivers up at the front would have to wait for quite a long time. The result was heartbreaking. The yellow Ralt on pole started creeping forward from its spot, everyone lining the start-and-finish straight was holding their breath. Oh no! Shaw slammed on the brakes and waved to the starter, as to say ‘I’m not gaining any advantage from this!’ before his car began on another slow creep. As soon as we saw the starter pointing back at Shaw, we knew he was in trouble. He led away from the start but soon enough the drivethrough penalty for a jump start came through. 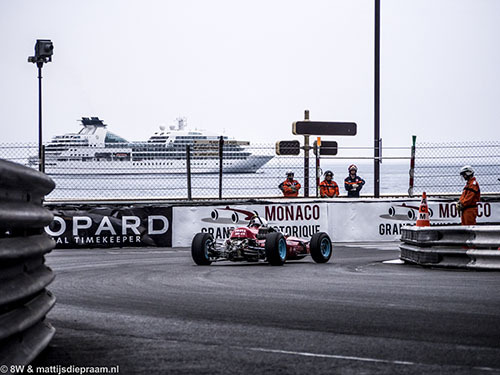 Having served his penalty and charging back to fifth place it was all made irrelevant when he went straight on at Rascasse, finishing his race. This left the race firmly in Barilla’s hands, who managed to shake off the attentions of countryman Valerio Leone in the newer March 783 to take a deserved win. The younger Hancock finished third. The weekend’s finale saw a Sunday’s drive to victory for young Lyons, repeating his 2012 glory. The race was over before it started when Sam Hancock’s Fittipaldi F5A stalled on the dummy grid. Sam had done a brilliant job by joining Michael on the front row in his first historic F1 race, but it had been to no avail. The car formerly owned by Richard Barber was bought by Bob Berridge and Anthony Hancock – and indeed serviced by one of Berridge’s Mercedes C11 Group C mechanics – for Sam to race. They had all hoped that the older of the Hancock brothers would steal Lyons’ thunder at the start and head into the lead. That would have made this a race. In the end, Charles Nearburg’s ex-Williams March 761 finished a distant second, while Nick Padmore’s challenge was also compromised from the start. Nick’s mechanic Paul Smith had already been worrying about the Williams FW05 overheating on the grid, and said that their race would be over if there was to be a repeat of the four aborted starts we saw in 2012. “It’s never going to survive that.” Hancock’s mishap did mean that the first start had to be aborted but that was it. Still, the Williams began blowing steam and leaking fluids as the fourth-placed car on the grid waited for the rest of the 30-odd car grid to take its starting positions. Nick was already gesturing frantically to the starter to get the race underway but had to wait five more seconds before he was finally allowed to gun away. It must have felt like eternity. Having started well, he fell back into the clutches of the following group of cars due to his overheating issues, but when the chance of a podium emerged he was told to carry on regardless. It must have wreaked havoc but the car made it across the line. The race finished under the safety car, which ended the weekend rather disappointingly, but then no-one was going to catch Lyons anyway. The youngster had done it again, in a Hesketh that used to be very much a tail-of-the-grid car in period. A very capable driver can make all the difference in historic racing, and here it was proven again. Still, a historic weekend like this is about the cars first, and the drivers second, and anyone knocking on F1 heaven’s door on Friday was richly rewarded. Now the wait is on for another two years. Wouldn’t it be a great idea, though, to have this event again next year? With the Le Mans Classic also held in even years, it would make odd years so much more interesting. ACM, are you listening?